Over a past few times, we have seen a steady growth in the online recruitment of Jihadis from social networking sites by many radical groups. ISIS has topped the online recruitment, and it is the only terror group that leverages the enormous power of Twitter and Facebook to radicalize young minds, spread its message and recruit foreign supporters to its fights. Many ISIS militants maintain extremely active accounts on the popular social media platforms and have a strong presence on the most popular encrypted messaging app Telegram with more than 100,000 followers. This issue had impacted the society deeply. Recent examples include last year’s Paris attack in which ISIS used some popular messaging apps to plot the attack. As the Dark Siders of social media began to turn this platform into a Terror-Picker, the White Siders of the same social media came under a single roof to declare fight against terrorism, and rage cyber war against these anti-humans. Facebook is also on the main line up to join the fight against terrorism. The social media giant has also come up with a solution to minimize the presence of caliphate group from its social media platform. Similar efforts have previously been made by Anonymous hacktivist group, who conducted various planned operation like OpISIS, OpParis, expunging ISIS channels from Twitter and Telegram. 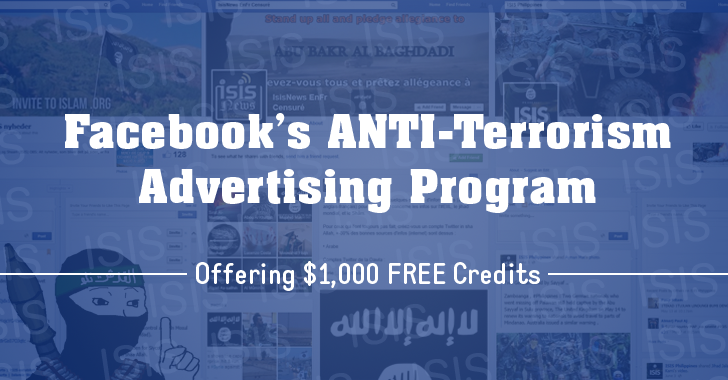 Recently, Facebook introduced a new program, dubbed "Counter-Speech," that offers advertising credits up to $1000 for those who raise their voice against hate speeches & terror propagandas. This new intelligent strategy would enlighten the immature minds of those who got influenced by the radicalized propaganda and created an automatic hatred towards the group (who tried to brainwash with their propagandas). So, rather than vanishing or blocking the extremist Facebook pages that spread hatred among its followers, Facebook is focusing on educating more and more young minds in an effort to fight against terrorism. Arbi-el-Ayachi - A German comedian had got benefited from the newly released Facebook plan when he released a video showing eating halal meat is poisonous to Christians, last year. How did the idea strike? The idea was formed by the current Facebook Chief Operating Officer Sheryl Sandberg while speaking at World Economic Forum last month. Sandberg backed up this idea by referring to a recent attack conducted by the group in Germany called "Laut gegen Nazis" (an anti-neo nazi group) had attacked the Facebook page of the far-right NDP by getting members to like ("Like Attack") and post on the page. "Rather than scream and protest, they got 100,000 people to like the page, who did not like the page and put messages of tolerance on the page, so when you got to the page, it changed the content and what was a page filled with hatred and intolerance was then tolerance and messages of hope" Sandberg stated. Gradually, the massive operation to fight against terrorist organizations began to hit the headlines and grabbed the attention of several tech giants like Google, YouTube, and Twitter. Youtube had wiped out more than 1000 dozens of radical videos from its database. Twitter had expelled 1,25,000 accounts of Jihadi members since in mid 2015. Google also rolled out a special advertising program for terrorist sympathizers who type extremism-related words in the search engine, but the "top" search results display anti-radicalized links. Joint ventures like this would act as a Digital Age Shield to minimize the threat levels.